The US Capitol. It's inhabitats are probably tweeting as you read this. Photo by Flickr user wallyg. From October to December, 2010, the Congressional Management Foundation (CMF) surveyed Capitol Hill staff about their use of online technologies to manage constituent, media and other communications. Their first report, released in January, 2011, was called Communication with Congress: Perceptions of Citizen Advocacy on Capitol Hill. The latest report to come from last year’s survey of Congressional staff, titled #Social Congress: Perceptions and Use of Social Media on Capitol Hill, was just released. The results are fascinating and important to anyone working in an organization using social networks and email to engage Congress on advocacy issues. The CMF report plays up the significance of social media in Congressional offices. That’s likely due to the historical perspective they have. After all, social media and online in general, even email, has been around a very short time relative to postal mail, office visits and other in-person interaction. Looking at some of the numbers here you’ll see that “in-person” and “personalized” interactions carry much more water on the Hill. This should perhaps serve as a warning to those trying to automate large-scale communications from constituents to Congress via Twitter or Facebook. Many Hill staff don’t think constituents are actually sending form emails. Social media interaction can be more personal so shoot to make it so. There is a radar seeking out impersonal and inauthentic messaging. Personal (or at least personalized) interaction is viewed as more valuable by Hill staff when it comes to interacting directly with constituents. Perhaps this is why staff see Facebook as a useful way of gauging public opinion: Facebook can provide unfiltered views from real citizens (though there is no way of knowing if that citizen is a constituent). Social media is also important when it comes to communicating the views of Representatives and Senators. Web and email newsletters dominate online communications from offices with social media right behind. In fact, 74% of senior and social media managers think FB is somewhat or very important for communications Members’ views. Hill offices like YouTube for communicating member views: 72% think it an important way to communicate with constituents. This reflects a long-standing understanding that video is a powerful communications device and a relative comfort with being on camera. Of course, once a video is on YouTube it can be embedded around the web and marketed via email, the member’s own website and social media channels. Most organizations are creating videos, of course. Lots of resources are going into creating “viral” videos to drive attention and list-building. Congressional use of video might be a lesson for organizations. Providing updates and news via short videos can be quick and easy to produce, have a long shelf-life, are easily embedded around the web and can be linked to from email and other communications. Plus, they can provide a level of personality, almost a one-to-one feel, that is harder to convey in writing. Congressional staff views of social media vary by age. Staff 30 or under find it useful. Those over 50, not so much. There is a clear difference in the perceived value of social media among different generations of Hill staff. Sixty-six percent of staffers 30 and younger feel social media worth the time offices spend on it. But only 32% of staff 51 or older feel it is owrth the time. 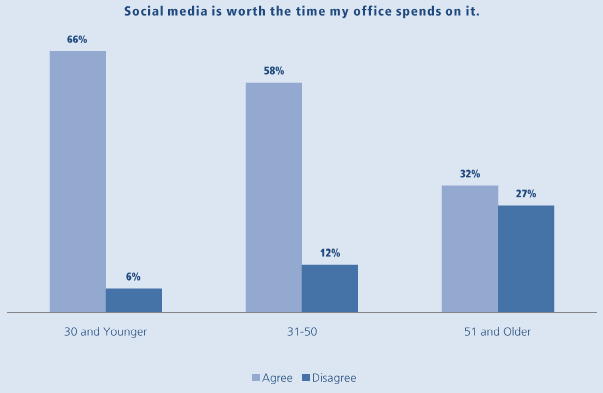 There is a similar split by age when it comes to feeling like the office can control the message on social media. The question worth asking may be the extent to which social media messaging and interaction fits into decision making. It is one thing to have a Facebook page or Twitter account for a member of Congress and staff it. But if that work isn’t well-regarded by office leadership then the action your organization generates may look good but not have much chance to transform policy. If you’re targeting key offices with social media it may be worth finding out how social fits into that office’s communications structure. Another good nugget from the report is the finding that offices that view themselves as early adopters of new technology and online communications find more value in social media. Self-identified late adopters are less enthusiastic about social media. Focus on activating constituents and have them state they are constituents if time/space allows. Segment your outreach messaging to better enable your activists to focus their interactions on their state or district. Identify and engage your most active social media users. Find out where they’re located and give them special opportunities to speak out to and engage their social networks. Chances are that an active user in Illinois is going to have a lot of friends Illinois that are also active. Engage them through your activist. Identify and track the level of online and social engagement in various offices. Those late to the technology party aren’t as interested in social media. Of course, maybe these offices don’t have a social media presence, making them easy to avoid. Understanding the capacity of a target will allow you and your activists to better engage them. Use video to talk about what’s going on with an issue. It doesn’t have to be super-shiny or instantly go viral to be an effective way of more personally conveying information to followers.